It’s not easy buying a meaningful gift for the ones we love. Often people don’t really need anything. Still, we buy something anyway because it’s the thought that counts. Even if that gift gets tucked away in the closet. The waste-conscious who no longer want gifts they’ll never use. People who prefer money that would’ve been spent on gifts for them, instead go to a good cause. Charities that rely heavily on public donations for their annual revenue stream. We quickly set our minds to creating a ‘phase 1’ website. Springload were passionate about their work and it was obvious they were committed to making The Good Registry a success. a user interface that reflected the brand and the client’s vision for a warm and welcoming platform. There’s still a lot we’d love to build on the ‘phase one’ site that we launched with, to increase our impact. We’d love to work with Springload to achieve that. The application was built with Ruby on Rails, a pragmatic framework that enabled us to develop rapidly and deliver a robust product. We took a minimalist approach to the front-end build using a lightweight and highly customisable CSS framework and server-side rendered HTML. A light sprinkling of vanilla JS makes it come alive. For the payment gateway we chose Stripe, which has a simple client onboarding process and developer friendly API’s. Phase 1** of The Good Registry allowed people to easily sign up and create an event registry. They’re then offered a choice of charities from an approved list curated and verified by The Good Registry. The platform then creates a public registry page which is shareable and allows people to leave ‘gifts’. From the initial whiteboard sessions, to building the software, and adding the final UI touches, together we’ve built a platform for sustainable giving. 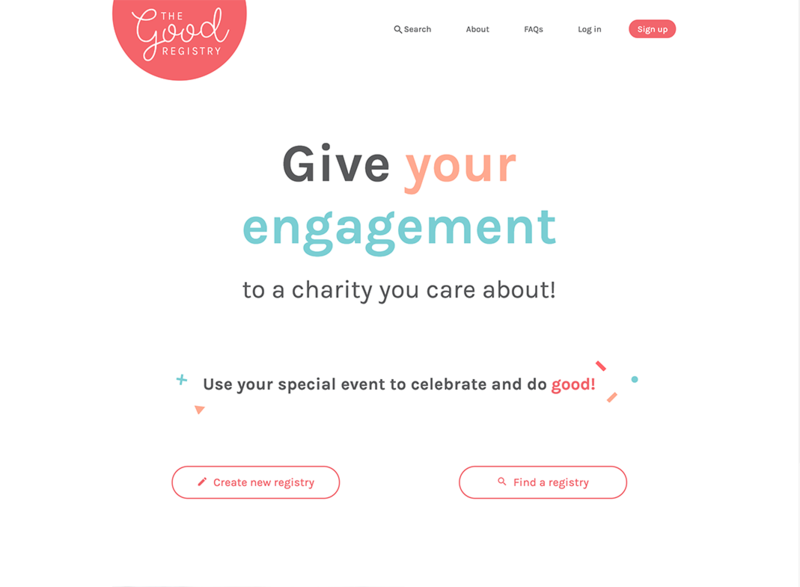 We’re proud to have had a hand in amplifying The Good Registry’s ability to do social good. *This project was undertaken by Touchtech who merged with Springload in March 2018. **Since launching, The Good Registry have moved their online store to Shopify to enable additional functionality. This includes launching Good Gift Cards, and a CMS to increase user engagement and enable regular content updates, such as a blog. Some of the design and content elements have changed.